If you double click on the button you have on a form, the following window will appear which displays the actual coding involved with the form and its controls. When you double click on a control in a form and the coding window appears, the wrapping code that can be seen in the image above is automatically produced. Your coding for that control goes in between these lines. 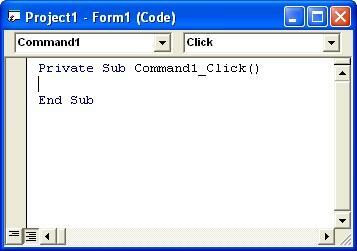 The Command1_Click() part of the code refers to the name of the control involved and the action needed to run the code for this control, in this case, a click from the user's mouse.